Here i a screenshot from the ServerFault FAQ. The images are from bicycles.stackexchange.com! Could this be fixed please? Edit. I had not noticed that it was the case for all FAQs on stackexchange. Still: shouldn't they be screenshots of the actual web sites for those that do not have the sketchy beta layout? 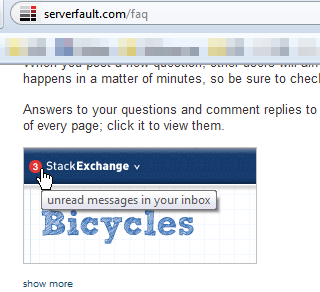 The image is the same on all sites FAQ window, it is just a generic image to show the inbox, it just happens to be from Bicycles.